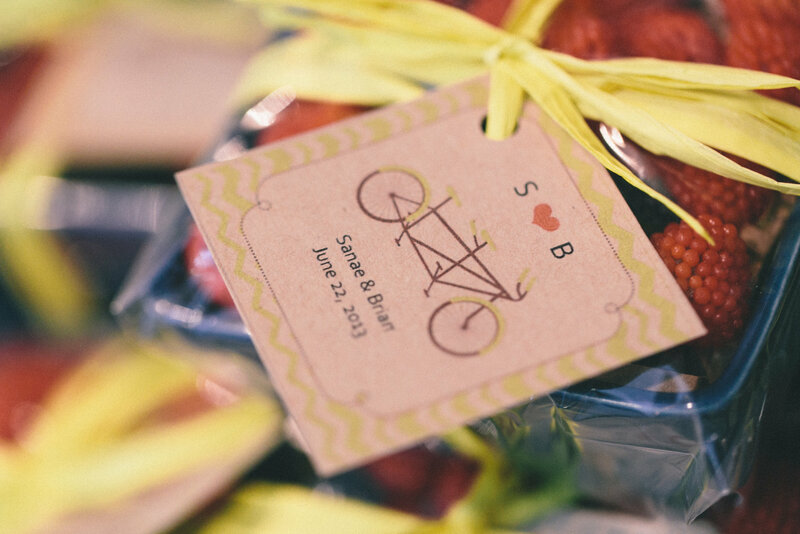 Summer brides, it isn’t too early to begin to think about ideas for wedding favors. I’ve been slow to share some decorating tips and ideas from my wedding, but as I’m slowly getting to it, I would like to share some photos of one tiny part of our wedding: our wedding favors. Summer weddings are well-loved and crown peak season, especially for the parts of the country that are known to be cooler, most months of the year. Although June-September fly by quickly and June brides seem to line up months in advance to get the best venues, caterers, dresses, and florists, there is much fun to be had in planning a June wedding. 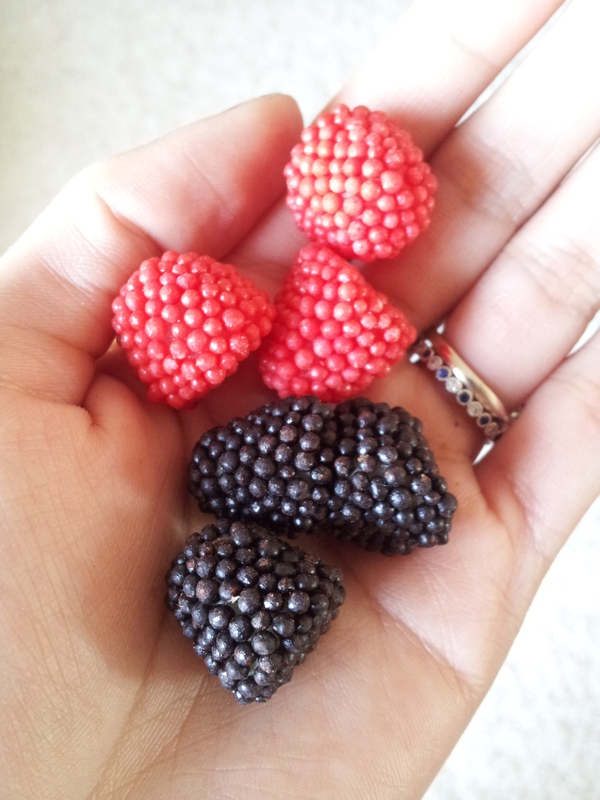 Berry picking is a fun summer activity, and although I have yet to personally participate in it, I’ve heard stories of family outings that make it seem like the perfect summer activity to do with close family and friends. 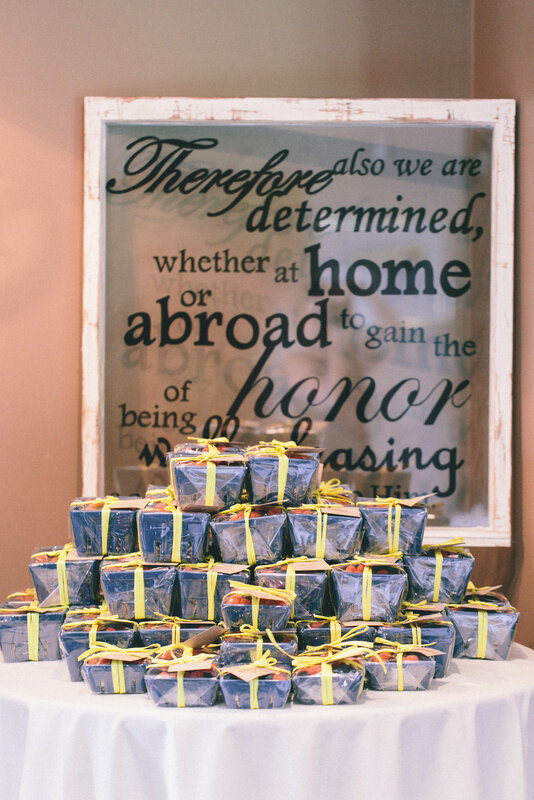 In keeping with this sentiment, I was thrilled that I could attempt to capture the feeling of a New England summer for our wedding guests, some of whom traveled far from different countries with a sweet treat in a useful and beautiful ceramic basket. The baskets are useful for washing, storing, and presenting fresh berries, or other fruits, or as a farm-table-esque part of one’s home decor. I got married in June of this past year and in keeping with our rustic-chic theme and intimate marriage ceremony at Harrington Farm in central Massachusetts, I finally settled on filling ceramic berry baskets from Sur La Table (they change the colors seasonally, so keep your eye out for a favorite color) with everyone’s favorite summer fruits, in non-perishable, candy form: German raspberries. Many friends helped put these together: finding paper shred to fill the bottom of the basket, locating a candy supplier, wrapping cellophane, tying cheery sunshine yellow raffia bows, cutting gift tags and digitally editing the cute tandem bike icon for us. We’re so thankful! 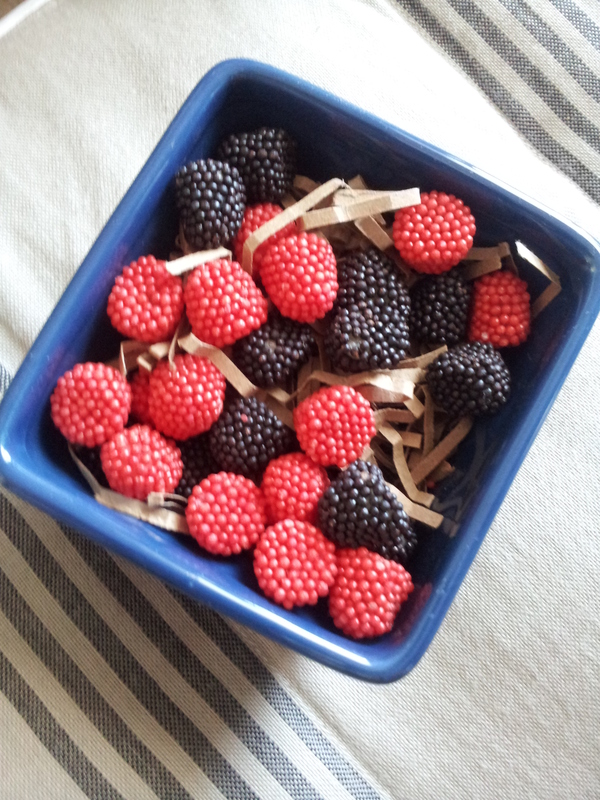 Although we considered buying fresh berries in bulk, the thought of them sitting out in the heat, or in cars as guests commuted, or even in carry-ons on a hot summer day quickly burst that idealistic bubble. 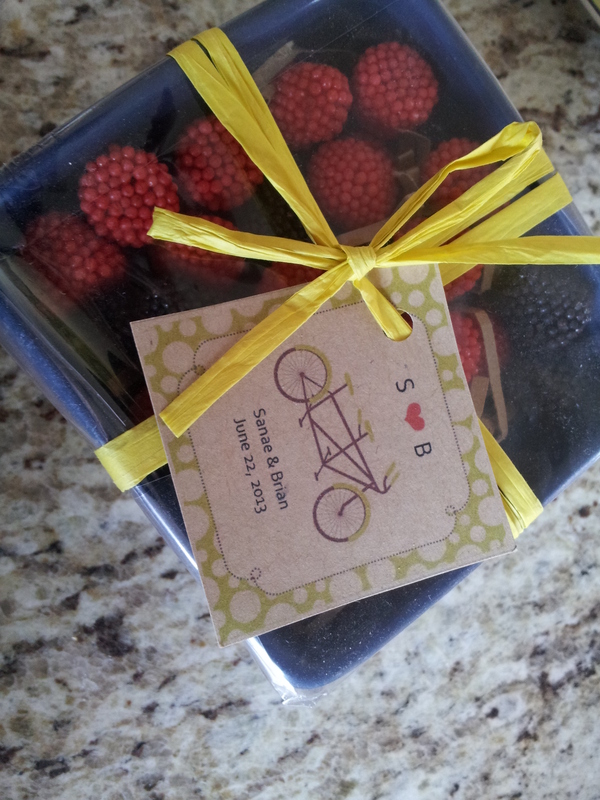 I’d had these German raspberry candies when I was a child and enjoyed them, so being able to present them as part of our thank you to guests made it just that more memorable and special. The verse in the photo above, 2 Corinthians 5:9, is taken from the Bible, and is significant to us for a couple of reasons. The most obvious connection is to our wedding theme, which involved travel to places around the world important to us, but presenting this verse near the exit with the favors has a deeper significance. Even as beautiful as all the decorations were, or how delicious the food was, or even how pleasant the day turned out, it is a message to all that my husband and I agree that we would like to “gain the honor of being well pleasing” to God. What does that mean? I’m not 100% sure that I have a handle on it, but to me, at least now it means that whatever we do, we do TO the Lord. Our lives are a service to God, and even merely our living and way of life has a particular expression. Colossians 3:17 – And whatever you do in word or in deed, do all things in the name of the Lord Jesus, giving thanks to God the Father through Him. 1 Corinthians 10:31 – Therefore whether you eat of drink, or whatever you do, do all to the glory of God. Colossians 3:23 – Whatever you do, work from the soul as to the Lord and not to men. Our wedding is TO the Lord, and although it is a celebration – of course, it is a celebration -it is foremost a gift of God bringing us together and not a preview of a vain life without meaning, empty in true content, but superficially well-arranged and managed. A wedding is the perfect place to express a life trajectory in many small and important ways, including honoring God. My friend made this beautiful sign for her own house, and it seemed very apropos for our wedding. Looking back at the picture, it certainly is an apt reminder of the significance of our lives, and I hope that it encourages you all and gives you something to consider! Happy wedding planning to 2014’s summer brides-to-be, and I hope that you found this post inspiring! Tags: 2 Corinthians 5:9, berry baskets, Bible, Boston wedding, Christian brides, Colossians, DIY wedding favors, ForeverCandid Photography, Harrington Farms, New England wedding, summer, summer wedding, Sur La Table, thankful, wedding, wedding favors. Bookmark the permalink. I love this post. Good use of decor and the verses from the Bible. I will have to consider them all. 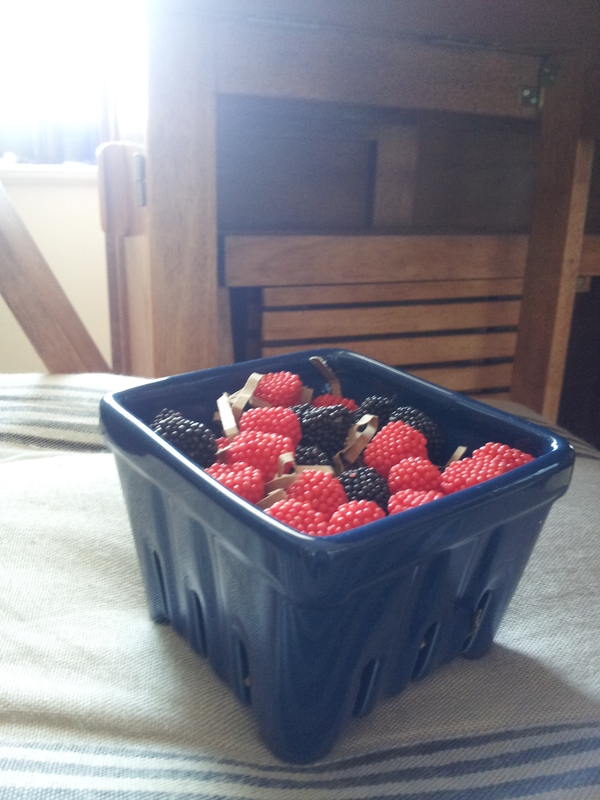 A berry, berry nice post! Follow NINI4NANA's board Wedding on Pinterest.